2010 ( TD ) · French · Drama · PG-16 · 92 minutes of full movie HD video (uncut). 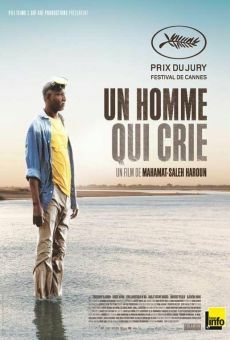 You can watch Un homme qui crie, full movie on FULLTV - Chad, today. Adam, sixty something, a former swimming champion, is a professor in the pool of a luxury hotel in N'Djamena. When some Chinese entrepreneurs acquire the hotel, is forced to leave his job to his son Abdel. Suffers badly from this situation, which considered a social decline. The country is plagued by civil war and armed rebels threaten power. The government, in response, turns to the population for a war effort that requires them money or children old enough to fight off the assailants. Therefore, Adam is constantly harassed by his Chief District to release your contribution. But Adam has no money, all you have is your son ... You are able to watch Un homme qui crie online, download or rent it as well on video-on-demand services (Netflix Movie List, HBO Now Stream), pay-TV or movie theaters with original audio in French. This film was premiered in theaters in 2010 (Movies 2010). The official release in theaters may differ from the year of production. Film directed by Mahamat-Saleh Haroun. Produced by Diana Elbaum, Sébastien Delloye and Florence Stern. Screenplay written by Mahamat-Saleh Haroun. Soundtrack composed by Wasis Diop. Commercially distributed this film: Film1, trigon-film, Pyramide Distribution, Nettai Museum, Soda Pictures, Cine Global, Cine Global Filmverleih, AmaFilms and Film Movement. Film produced and / or financed by Fonds Francophone de Production Audiovisuelle du Sud, Centre National de la Cinématographie (CNC), Pili Films, Tax Shelter de Facoz, Le Tax Shelter du Gouvernement Fédéral de Belgique, Goi-Goi Productions, Entre Chien et Loup, Canal , Casa Kafka Pictures,. As usual, the director filmed the scenes of this film in HD video (High Definition or 4K) with Dolby Digital audio. Without commercial breaks, the full movie Un homme qui crie has a duration of 92 minutes. Possibly, its official trailer stream is on the Internet. You can watch this full movie free with French or English subtitles on movie TV channels, renting the DVD or with VoD services (Video On Demand player, Hulu) and PPV (Pay Per View, Movie List on Netflix, Amazon Video). Full Movies / Online Movies / Un homme qui crie - To enjoy online movies you need a TV with Internet or LED / LCD TVs with DVD or BluRay Player. The full movies are not available for free streaming.